The Umkhumbane Museum, South Africa, by Choromanski Architects was awarded the Grand Prix at the Africa Architecture Awards. The Grand Prix winner received both a bespoke trophy and the cash prize of USD$10 000. At a gala awards ceremony held on the rooftop of the Zeitz MOCAA in Cape Town, the inaugural Grand Prix and Category Winners of the Africa Architecture Awards were announced on the evening of Thursday, 28 September 2017. Over 130 VIP guests were in attendance at this glittering event, including the Consul-General of France in Cape Town, Mr Laurent Amar, the Chairman of the French South African Chamber of Commerce and Industry, Philip Geromont, and Claude van Wyk of the Kingdom of The Netherlands Consulate General in Cape Town. The shortlisted finalists were flown into South Africa from across the continent and the world, and hosted by awards founder and sponsor Saint-Gobain. The much-anticipated gala was the culmination of an ambitious two-year awards programme that was initiated and supported by construction industry innovator Saint-Gobain with the ultimate aim of stimulating conversations about African architecture as it cements its place in a global continuum. 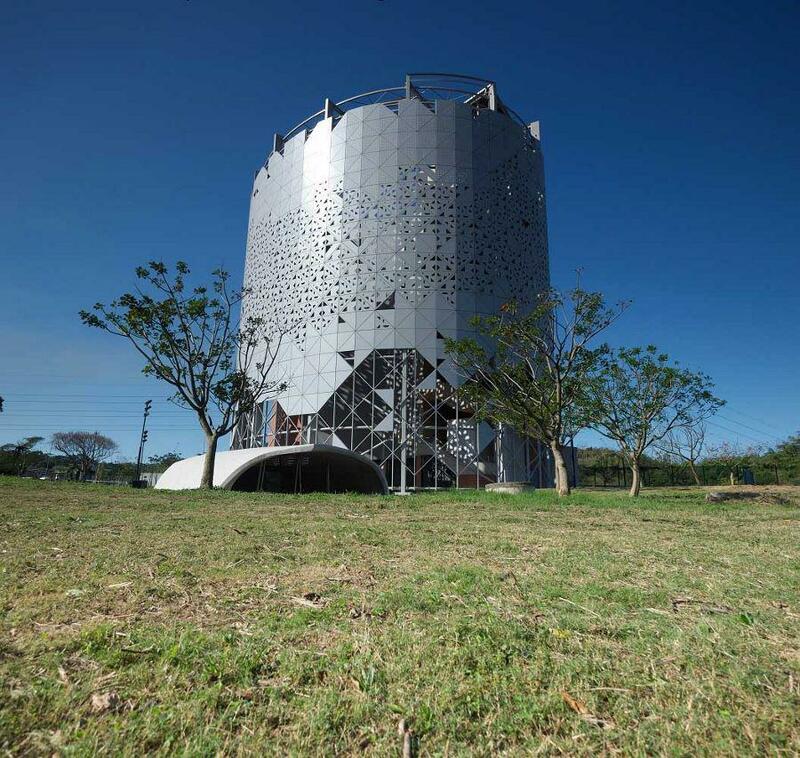 The Africa Architecture Awards is the first-ever Pan-African awards programme of its kind. A steering panel headed by Professor Lesley Lokko guided the awards with strategic input from ambassador Phill Mashabane, advisor Zahira Asmal, and patron Sir David Adjaye, one of the globe’s most influential voices in architecture. Adjaye’s statement is borne out by the high level of interest the competition has received from architects working on projects located in Africa. Over 300 projects from 32 African countries were entered into the awards. For the inaugural edition of the Africa Architecture Awards, the organisers set themselves an initial target of 150 entries from 20 African countries. Consider then, what a huge task faced the Master Jury when the awards exceeded all expectations and grew to 307 entries from 32 countries in Africa – more than double the size of what was initially envisaged. The initial shortlist of 21 projects was chosen by the Master Jury and announced earlier in 2017. Chaired by Dr Mark Olweny, the jury comprised leading African architects and academics including: Anna Abengowe (Nigeria), Guillaume Koffi (Côte d’Ivoire), Professor Edgar Pieterse (South Africa), Patti Anahory (Cape Verde), Tanzeem Razak (South Africa), and Phill Mashabane (South Africa). The Grand Prix was awarded to the project that best describes the ultimate objective of the Africa Architecture Awards, which is to inspire the future of African architecture. The Grand Prix winner received both a bespoke trophy and the cash prize of USD$10 000. Umkhumbane Museum, South Africa – by Choromanski Architects was named the overall winner. In addition to the projects highlighted by the Master Jury, the awards programme ran a public participation component earlier in 2017, where members of the public could vote for their favourite project. The People’s Choice Award had over a million viewers and votes across a range of projects stretching from kiosks to urban regeneration schemes. The winning project received a Certificate of Excellence at the ceremony and this went to James Cubitt Architects Lagos for the speculative project titled Bank Head Office in Lagos, Nigeria. Following the awards ceremony on the Thursday evening, a thought-provoking public colloquium titled ‘Celebrating Architecture in Africa’ was held on Friday, 29 September 2017 at the University of Cape Town. With a speaker line-up of 21 specialists from across the world, the free event, which was also supported by Saint-Gobain, provided a platform to discuss the awards in more detail and explore architecture within the African context. Providing access to information about architecture in Africa and ensuring that this knowledge is shared widely and freely to the continent is a primary and ongoing aim of the awards. This is evidenced in events such as the colloquium, as well as publications such as the Africa Architecture Awards’ digital portal, www.africaarchitectureawards.com. Documenting all 307 projects entered into the awards via video, images and text, this digital asset now stands as one of the most vibrant and extensive repositories of contemporary African architecture to date. Described as the “4th Revolution” in Africa, digital channels and technology shift paradigms daily on the continent. From the outset, awards founder Saint-Gobain has embraced the role of digital media to promote architectural practice and dialogue to broader audiences than traditionally enjoyed by institutional award structures.